What are these little squishy pockets of super fresh veggies truly called, y’all? 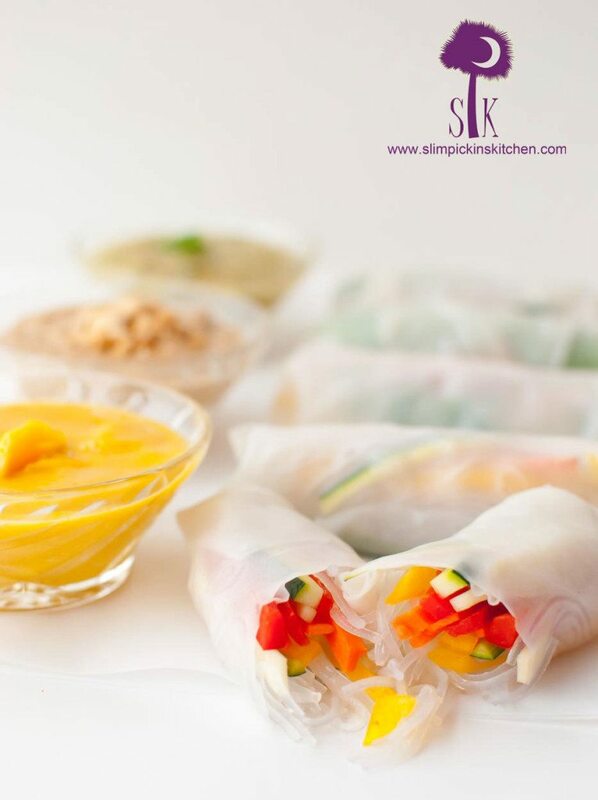 My vote was originally summer rolls, but my husband insisted they were called spring rolls. I, being the know-it-all must be right foodie that I am, stated that he was clearly wrong because spring rolls were fried and these were not so they were definitely called summer rolls. Weeell after walking away victoriously knowing that I had just showed him, I decided to have a looksie at the packaging. In deep blue text written as clear as the rice paper wraps tucked inside, were the words “Spring Roll Wrappers” with pictures of both the fried and cold versions slapped on the front. 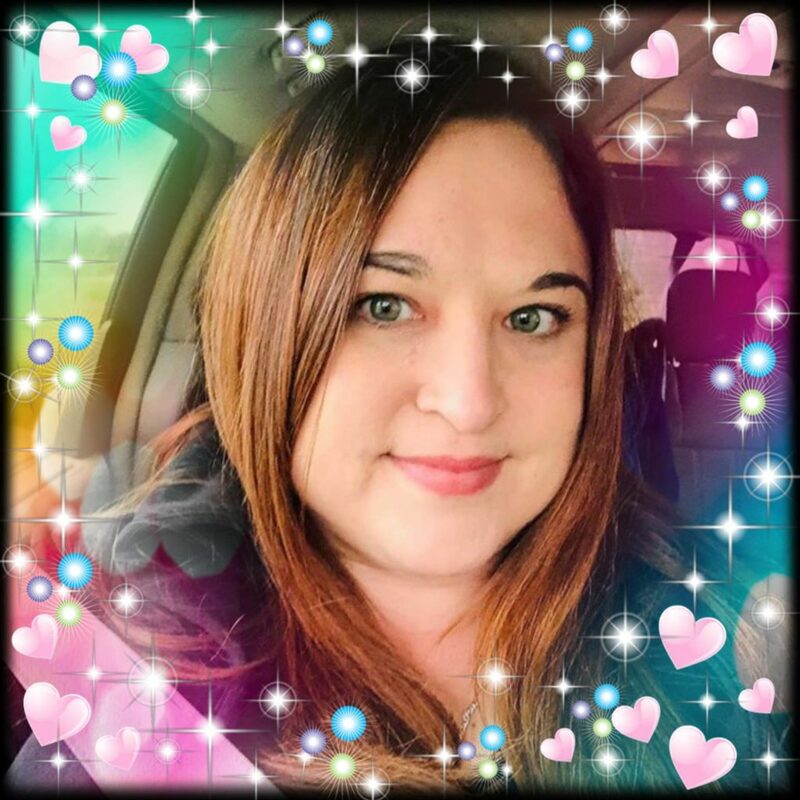 When he came home that night, I begrudgingly sulked over to him and admitted that he was right and I was wrong (gasp!) all the while refusing to actually believe that that was sincerely the case. I then contacted the smartest source I know, and I Googled the crap out of that nonsense. Surely I would find my answer there. I found the website of our favorite little Thai hole in the wall because I knew they had these on their menu and they, of course, would clearly know the correct terminology for these crunchy rolls of sunshine. So what did they call them? Since they’re crunchy and soft and sweet and squishy just like Easter candy can be (Peeps?) I decided to cast my hubs a line and call these spring rolls because they’re just so dang…springy! The rolls themselves are more of a method rather than a recipe because you can really fill them with whatever herbs and vegetables you may have on hand. These are the perfect way to use up the contents of your crisper drawer and are so incredibly versatile. I used fresh basil, yellow & red bell pepper, carrots, zucchini, and cucumber for the ones pictured, and I even added some leftover grilled chicken to a few of them too. 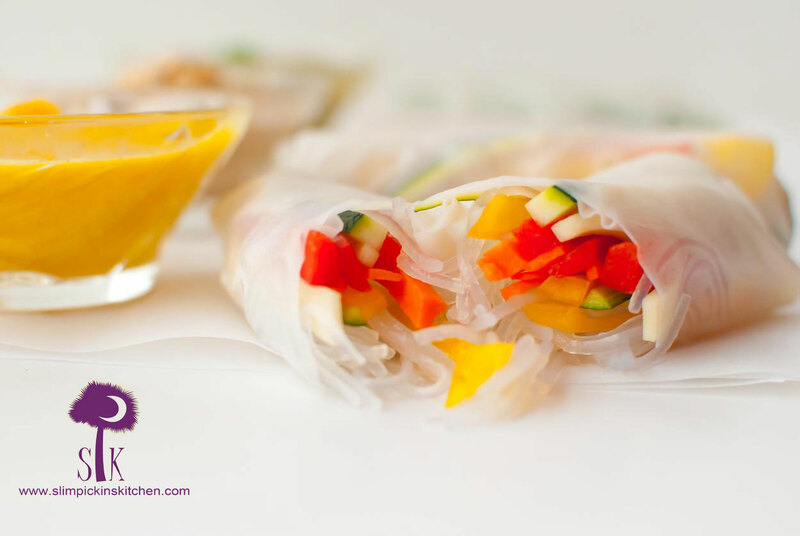 These spring rolls are a great make ahead meal and can be prepped days in advance. That was totally my plan with these until I whipped up the dipping sauces. O my M to the G the dipping sauces!!! 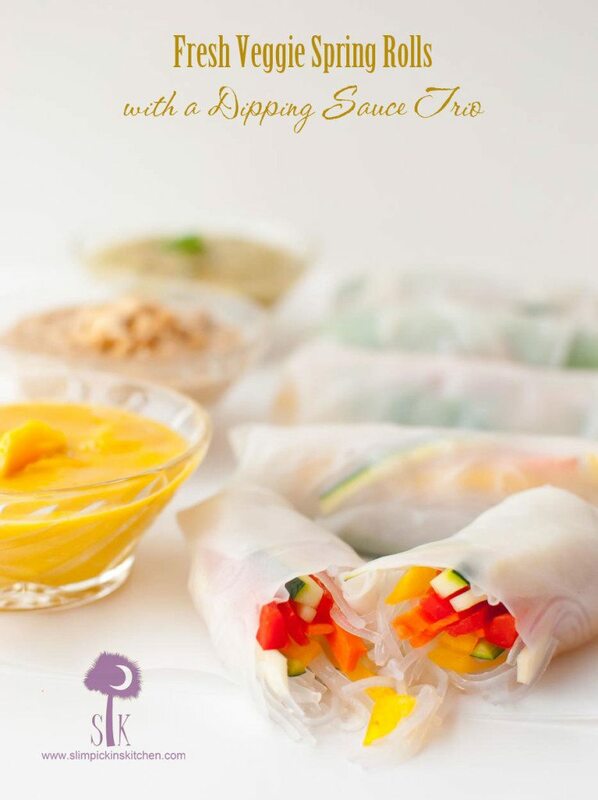 Words can not express how captivating a couple of sauces and a handful of spring rolls can be. 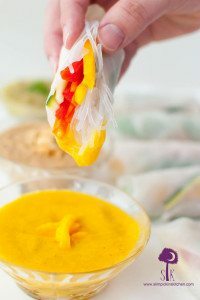 My husband, mother-in-law and I sat in the kitchen dipping our spring rolls in one sauce after the other claiming that the mango mustard was the best, but no the pineapple jalapeno salsa gave them the perfect punch of heat, but then again the traditional Thai peanut was classic for a reason, but for the love of all things holy the mango mustard was magical…and this went on and on and on until my weeks worth of lunch was scarfed down in 5 minutes flat. Apparently meal prepping isn’t an option around these parts when dipping sauces are involved. Spring rolls or summer rolls? 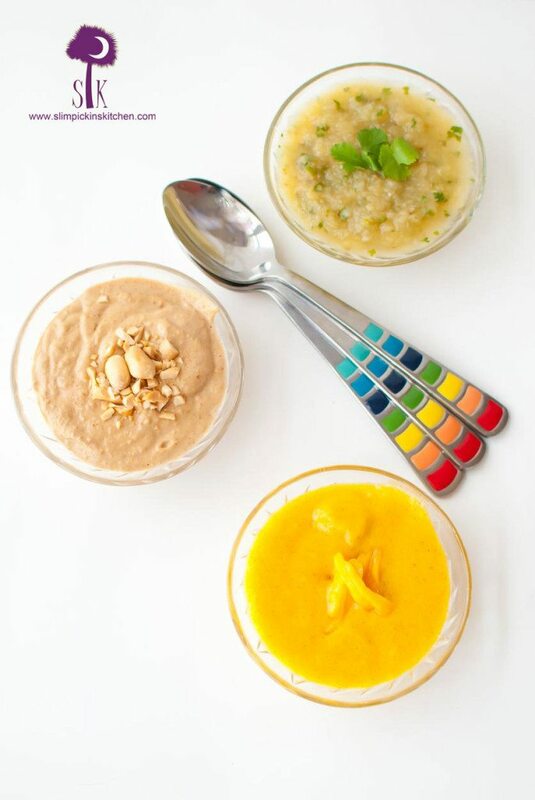 Which dipping sauce will you make first? 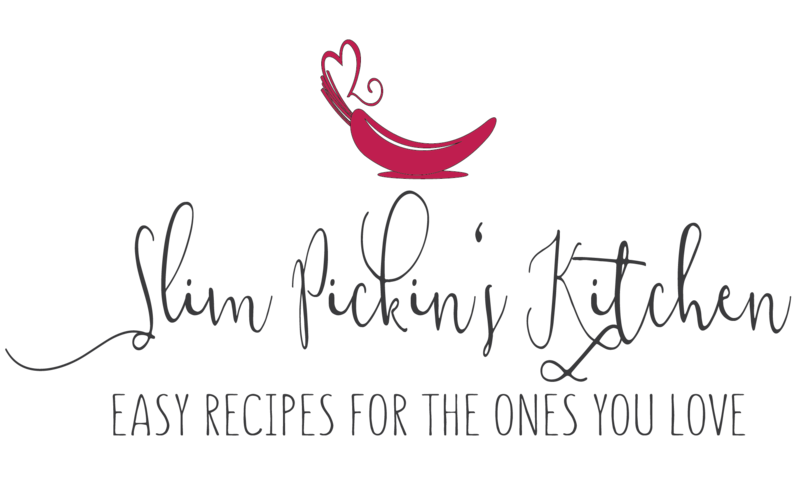 Make dipping sauce(s) of choice and refrigerate. Cook noodles according to package directions. Drain noodles, but add the hot water to a large bowl (big enough to add wraps to). 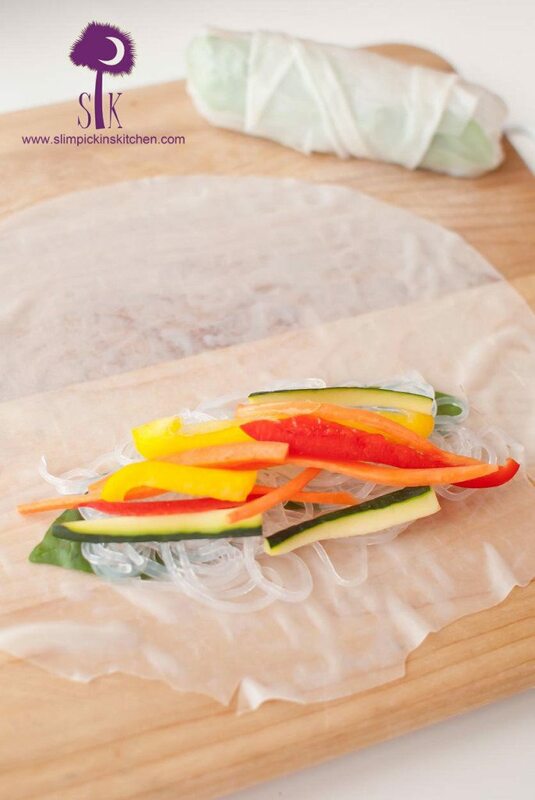 Add one rice wrap to the hot water and let soak for 10-15 seconds then remove to a wooden cutting board. Layer basil leaves, noodles, and veggies as desired, and roll like you would a burrito, tucking and wrapping the sides as you go. Place on a cookie sheet, plate, or plastic container lined with wax paper (seam side down). Repeat with remaining ingredients. Add all ingredients to a food processor and blend until smooth. Refrigerate until ready to serve. Add all ingredients (except water) to a food processor and blend until smooth. If the sauce is too thick, add in hot water a tablespoon at a time until desired consistency is reached. 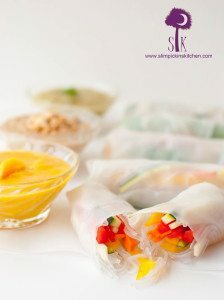 Hi, here in Australia, ( i’m British but live in Aus) we call these rice paper rolls, i love them! Your dipping sauces look great, can’t wait to try them. After extensive ( ahem) testing I think i love the Thai peanut one the best, but they are all delicious. Also, I made a batch of these this week, and had some left over, the next day i heated them up on a spray-oil heated hot plate, until the outsides were charred, they were amazing!